J isn’t just for Jay Z, it’s also Juniper Berry !! When it comes to superfoods, berries are right on top of the list because they are crammed with beneficial antioxidants. One such berry that can help you a great deal is the juniper berry and over the years, scientific research has shown what a marvel it is. 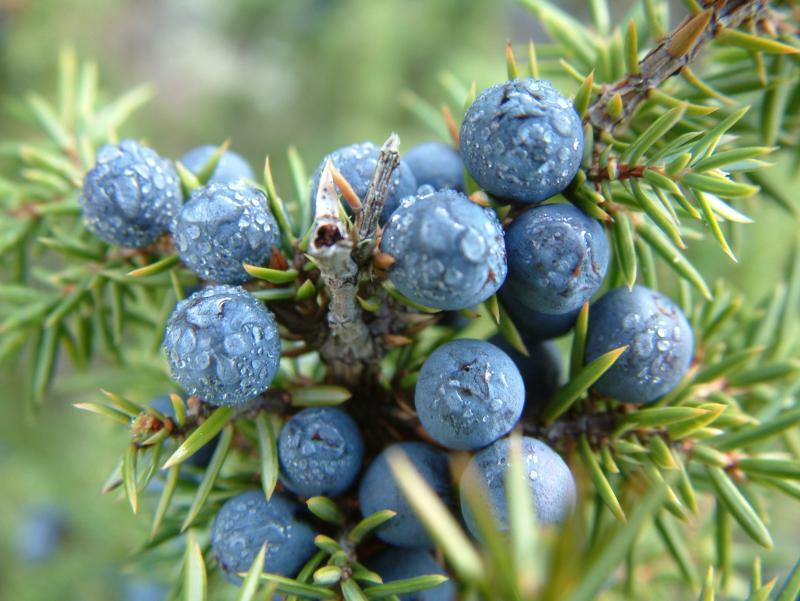 Botanically speaking, the juniper berry isn’t an actual fruit but the juniper plant’s seed cone. It’s considered as a berry because of its scales. The juniper is an evergreen tree and there are apparently 6 species of this tree whose berries are edible and used for a lot of beneficial purposes. Juniper berries are widely used in European cooking, particularly meat based preparations as it lends a unique flavor. Gin lovers also might be surprised to learn that juniper berries are the main ingredient in gin. But the juniper berry is most well known for its reputation as a herbal remedy for an amazingly long list of diseases and ailments. How does do it …. Read on ….. The juniper is indeed a useful tree as most of its parts are used for some sort of medicinal preparation or the other. So, the berries, leaves, bark and even oil derived from the berries and wood are used in various ways. Essentially a bitter tasting berry, the juniper berry contains numerous volatile oils or essential oils, vitamin C, flavonoids, fiber and whole slew of active constituents that make it the power packed healer that it is. Note that juniper berries can be consumed in the form of teas and the crushed berries can be applied topically as well for a variety of ailments. * Juniper is considered to be a herb with the most powerful effects on kidneys. It is also used to treat various urinary tract infections and it can remove uric acid from the body. Juniper makes the kidneys work faster and the body produces more urine, making it an excellent diuretic as well. * People facing water retention problems can experience a lot of relief with the juniper berry and its oil because of its diuretic properties. * Oil from the juniper berry has an antiseptic effect and it comes as a great relief to people suffering from cystitis and urethritis. * Suffering from digestive problems? The juniper berry might just be your answer as it can help reduce flatulence and colic and aid digestion. It also eases problems such as belching, bloating and heartburn. As a digestive aid, it’s excellent as it increases the appetite, relieves gas and boosts the production of gastric acid. * The juniper berry also has anti-inflammatory properties and it’s of great help to those suffering from arthritis, gout and other diseases such as rheumatism. These joint related ailments occur because of the fluid retention around these joints and the juniper berry with its diuretic action relieves this pressure considerably. * Skin ailments such as acne, dandruff and athlete’s foot can also be treated with topical application of the juniper berry. * Juniper helps in reviving the muscle tone and considerably reducing the effects of ageing for most people. * Menstrual cramps are often some of the most troublesome aspects of a woman’s life, but these can also be reduced significantly with the help of the juniper berry. Some herbalists even use the juniper to improve the uterus tone and to help those who have slow or late starting periods. * Concentrated oils of the juniper are used topically for lung congestion and coughs while it is also important in helping those suffering from respiratory infections. The volatile oils help in easing up bronchial passages and removing mucus. * It has a high concentration of insulin and helps in healing the pancreas. * Essential oils derived from juniper berries can help in relieving toothache and making gums stronger. It can also be used to control hair fall. * Finally, the juniper berry is used by many to lose weight and since it even cleanses the toxins from the body, it is a great overall purifier as well. The juniper berry does have some notable side effects and it’s important that you’re aware of them before you start using them as any form of treatment. * Avoid the juniper berry if you have severe kidney problems as it can aggravate the problem and cause further damage. * If you use more than the prescribed amount, chances are that you could suffer from diarrhea, kidney pain, high blood pressure, fast heartbeat and purplish urine. * When taken internally, it can affect the absorption of iron and various other minerals. * Open wounds are best not treated with juniper because it can cause irritation and swelling. * Juniper causes uterine spasms and could result in lowered fertility, so women who are attempting to get pregnant should avoid juniper. * Pregnant women should not use juniper as it can cause uterine contractions and cause an abortion. * Diabetics should be careful while using juniper as it can increase the levels of glucose in the body. The juniper berry when taken in advisable amounts and with people who do not have the indicated problems as mentioned above, can be a godsend as it provides them with a lot of relief. So besides enjoying some Jay Z, enjoy some J for Juniper berry while enjoying better health.